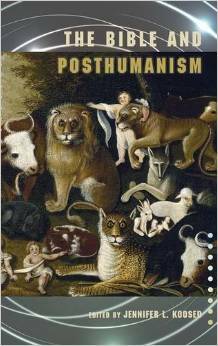 Some readers may be interested in a recently published book—The Bible and Posthumanism, edited by Jennifer Koosed. The volume includes an essay of mine entitled “Gregory of Nyssa and Jacques Derrida on the Human-Animal Distinction in the Song of Songs.” I have yet to read through the whole book, but I am especially looking forward to essays from Denise Kimber Buell, Stephen Moore, and Benjamin Dunning. I’m particularly honored that my essay sits directly next to Ben Dunning’s insofar as his intellectual generosity and meticulously patient criticism have played an unparalleled role in my own thinking, writing, and research at Fordham. Thinking with Derrida, I argue that Gregory’s discourse on animality remains irresolvably conflicted. Although he labors toward it, Gregory’s theology cannot finally abide a categorical distinction between humanity and animality. The theological anthropology informing Gregory’s anagogical exegesis of the Song of Songs “short-circuits” so that human animality is necessary to reach the deepest meaning of Scripture and the summits of spiritual ascent, despite Gregory’s more explicit claims that spiritual transformation entails the transcendence of humanity beyond animality. Animality remains integral to Gregory’s reading of the Song of Songs, not simply because of the pervasive animal metaphors within the text under his consideration, but on account of his understanding of theological exegesis and the role of desire in spiritual progress. Thanks Tim! Hope to catch up soon. The Limits of the Thinkable :: Coming Tomorrow!